Desert Golfing is probably one of the most simplistic iPhone games I’ve ever encountered. It’s also one of the most addictive. Here’s a list of things that Desert Golfing ($1.99) doesn’t have: Music. Settings. Game Center support. Pause button. Level select screen. Replay option. High score list. A tutorial. In-app purchases. Desert Golfing is probably one of the most simplistic iPhone games I’ve ever encountered. It’s also one of the most addictive. Desert Golfing is a 2D golf game, much in the same vein as the other fantastic iOS golf title Super Stickman Golf. The difference between the two is that where SSG require you to tap Play, select a game mode, a tour and a level pack before you can tee off, Desert Golfing just drops you right into the first stage. There’s a vector-based field, a ball, a hole and a flag with the number one. There are no instructions. This is golf, after all. You know what to do. 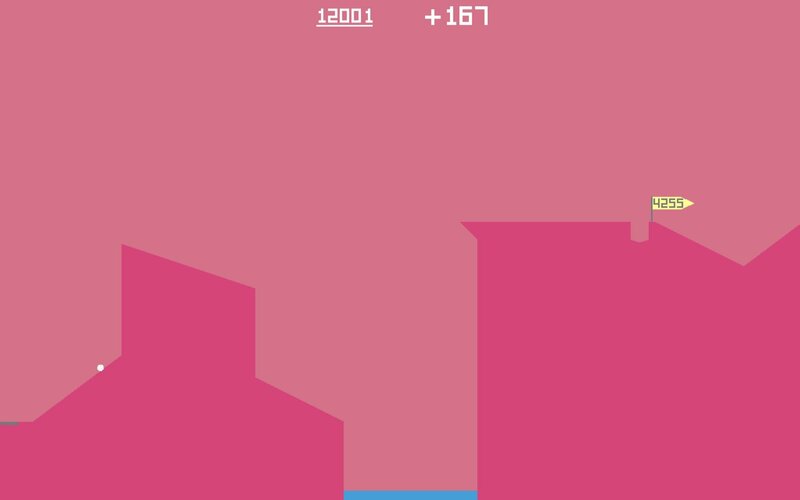 Desert Golfing is as polished as it is spartan. When you put the ball in the first hole in Desert Golfing, however, the camera pans to the right, revealing a second hole with a flag and the number two. The ball is raised from the hole you just put it in, and you’re free to take on the next stage. Repeat ad infinitum – perhaps literally, as the stages are generated procedurally. As I’m writing this, I’ve just sunk the ball in hole 751. From the gameplay to the visual design to the audio effects, Desert Golfing is as polished as it is spartan. There isn’t even a visual cue or special audio effect to congratulate you on getting a hole in one. All you get is the satisfaction of seeing the total strike count increase with no more than a single strike. Then the screen pans to the right, and the ball is raised from its hole. Onwards to hole 752.